In a vertebral artery dissection, blood enters between layers of the vertebral artery, resulting in diminished blood flow. This can cause a stroke, dizziness and vertigo, visual disturbances, and numerous other neurological disturbances. More material is found on another page on this site concerning chiropractic manipulation related strokes. The vertebral arteries begin in the neck generally taking their origin from the subclavian arteries. They next enter the bones of the neck (vertebrae) at C5-C6, and then ascend upward through holes in the bones called "transverse foramina". 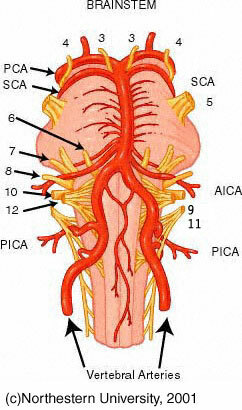 Between the top 2 vertebrae, C2 and C1, the vertebral arteries move laterally. Next they enter the skull, and eventually join together to supply the brainstem and cerebellum. The vertebral arteries are thought to be most vulnerable above their exit from C2 where they have several points of fixation. They are fixed at the C1 transverse foramen, the groove on the superior aspect of C1, and the dura intracranially. (Mann and Refshauge, 2001). Elongation of the "stiff" vertebral arteries by rotation. 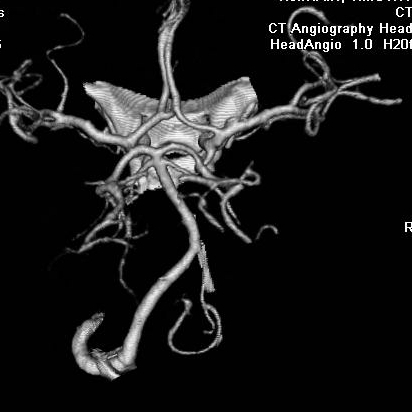 We favor CT-angiography with 3D reconstructions, to identify vertebral arteries that are hypoplastic or asymmetric. In a person in whom there is a strong chance of dissection, selective vertebral angiography may be appropriate. 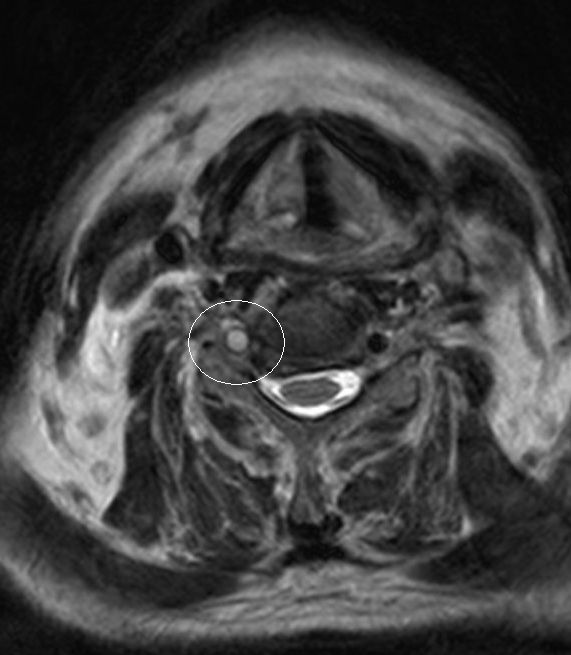 See the cervical vertigo page for a longer discussion about the radiology of this condition. CT angiogram. Left vertebral (left lower) is large and dominant. Right vertebral (right lower) is small and hypoplastic. This is the same case as shown in the selective vertebral angiogram below. An older man fell down the stairs, and broke his C1 cervical vertebrae in several places. 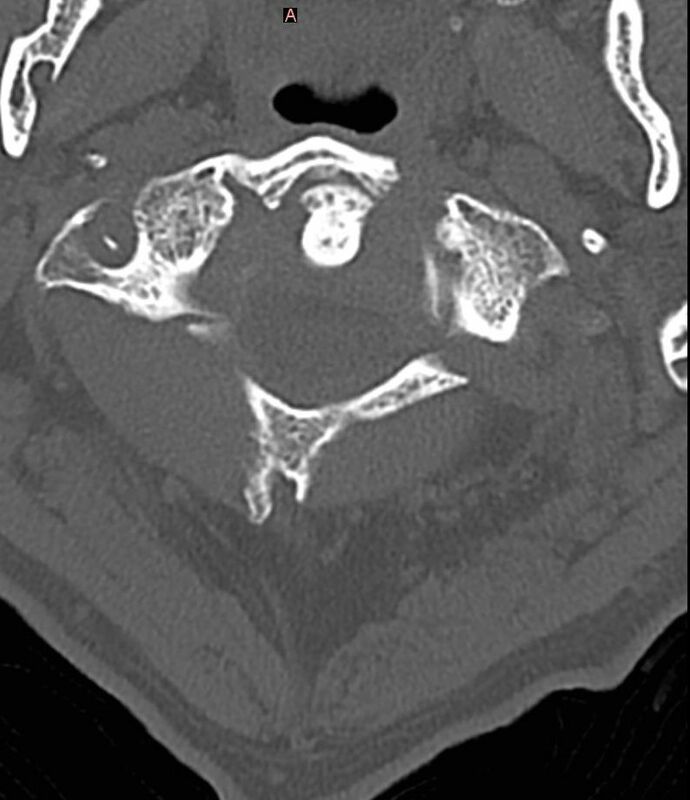 Accompanying the break was a complete occlusion of the right vertebral artery. Of interest was that due to stagnant flow, MRA contrast accumulated in stump of remaining R vertebral (see circle on right-most image). A 45 year old woman went to a chiropractor for treatment of neck pain. The chiropractor "snapped" her neck. After this occured, the woman lost hearing on one side, temporarily. Investigation revealed that one vertebral artery was atrophic. 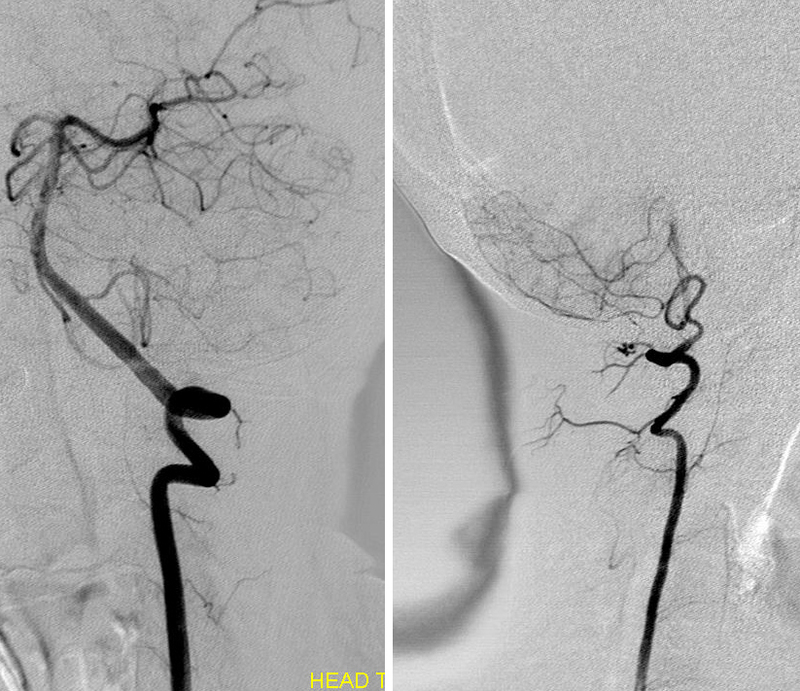 Selective Vertebral Angiography - -demonstrates that left vertebral (on left) is large and normal, while right vertebral artery is small and does not fill the basilar artery. Note the normal "kink" that occurs in the vertebral artery around C1-C2. 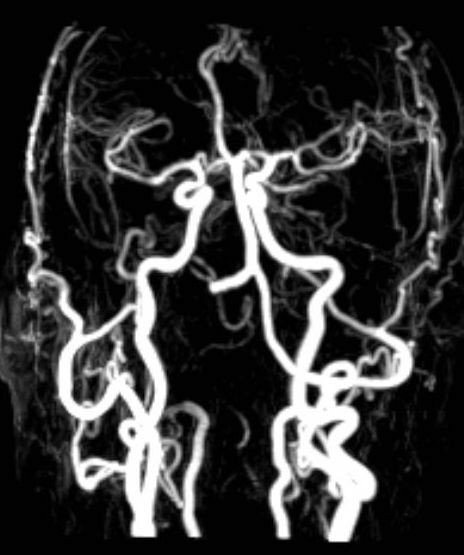 Comment: About 2% of vertebral arteries are hypoplastic. When this occurs, rotation of the head to the end of range may block the other side and cause brainstem ischemia. Rothwell, D. M., S. J. Bondy and J. I. Williams (2001). "Chiropractic manipulation and stroke: a population-based case-control study." Stroke32(5): 1054-60. Smith, W. S., S. C. Johnston, E. J. Skalabrin, et al. (2003). "Spinal manipulative therapy is an independent risk factor for vertebral artery dissection." Neurology60(9): 1424-8.